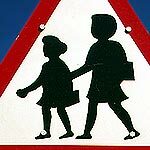 A most peculiar sign, one of the very few where a man accompanies a child to school. 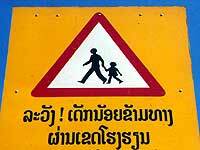 The same situation occurs only in Hungary, Israel and on one of the many roadsigns from Madagascar. In the first two countries the man is shown just standing there and clearly not knowing how to handle the situation. Is he contemplating passing traffic? 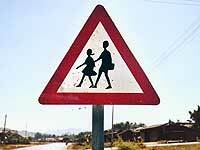 The behaviour of the man in Ambositra (Madagascar) is even more ambiguous: is he pushing or pulling the girl? But here, in Laos, the situation is clear: this girl will soon be behind her desk, learning whatever was scheduled for today. Nice try — that's our scientific watchguard — but you forgot about the real question: why a man? . Could it be that this scene is chosen in support of the government policy of emancipation and stimulation that women play an important role in the economy? Man should underscore this and do their part in the household. 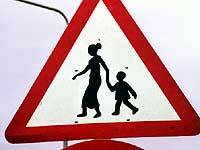 Our team — during a follow-up visit — discovered a new class of road signs where the man ordered his wife to the road. 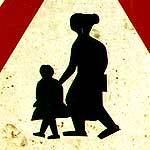 It's the same child with the same behaviour: it's a girl and she follows the adult and she has no need to carry things back and forth. 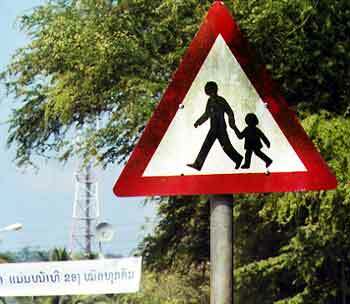 We've also noticed that at some places the person in command prefers to keep the child in sight. Several variations are shown. We have a man with a girl in an ambiguous situation. He's stopping her and she — in a reflex — is tucking head between shoulders. 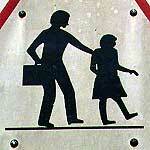 The adult is holding the bookbag. 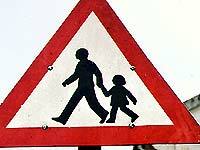 + He could be one of those parents who do their offspring's homework and he's saving her from an unpleasant trafic experience. 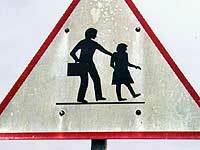 + Or is he perhaps a molester who has just snatched her bookbag? The equivalent version with the lady with the big feet is more peaceful. I should have mentioned it at the collector's pages. Image improvement starts on the field. Photoshop and the Gimp are not allmighty. We're talking with airlines about raising team-member's cleaning fluids allowance. Most people would call it a day. But that's not like our people on the move. In our profession Stop is a very important word (see vocabulary ) but real team members shall never use it towards themselves. 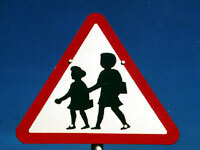 So, a third class was found where two children are seen walking towards school. No adult is watching them. 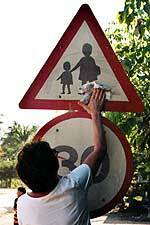 That this is not always a good idea becomes obvious when you look a bit closer to the first row. 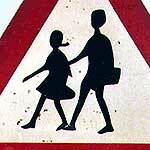 The girl is hurting the boy by stamping his foot (see also Egypt).